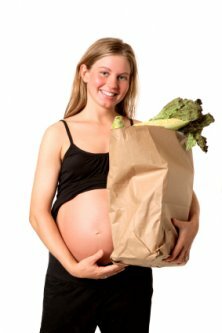 If you always eat a healthy and well balanced diet, you may not need to make changes when you discover you are pregnant. However, most of us aren’t that perfect. Once women become pregnant, what we ingest suddenly takes on new significance. Increase Fluid Intake for the well being of both you and your baby. Milk and juice are good sources of nutrients, but don’t forget to drink your water. Water is important for many reasons during pregnancy. Water is needed for the production of amniotic fluid. This fluid protects the baby during pregnancy and is constantly being replaced. Dehydration can lead to preterm labor. This is another good reason to include plenty of water in your diet. For the mother, staying well hydrated has several benefits. Staying well hydrated can reduce some common pregnancy discomforts, such as morning sickness and constipation. When you are dehydrated, you are more likely to suffer from urinary tract infections. Pregnant women should include eight glasses of water in their daily diet. Cut out Caffeine, Alcohol and Tobacco for the health of your baby. Caffeine acts as a diuretic and can contribute to dehydration. Alcohol has a similar affect on the body, which is one factor that contributes to hang overs. In addition, alcohol can contribute to miscarriage and lead to fetal alcohol syndrome and fetal alcohol effects, which is a less serious, but still dangerous condition. Choose Healthy Foods for both meals and snacks. A healthy and well balanced diet will provide your baby with the nourishment that is needed for proper growth. In addition, eating a balanced diet can help reduce the risk of certain complications that may be linked to excessive weight gain, such as pre-eclampsia and gestational diabetes. Some women find their moods and morning sickness are improved with a healthy diet. A balanced diet should include a variety of nutrients. Complex carbohydrates, fresh fruits and vegetables, protein, calcium and iron are some of the nutrients that should be included in your diet. Keeping a diary of your food intake can help if you have trouble keeping track of the nutrients in your diet. For more information on the foods to include in your diet check out http://www.pregnancy-info.net/nutrition.html. Fish containing mercury such as shark, tilefish, king mackerel and swordfish. Tuna should be limited to one serving per week. Undercooked meats can harbor dangerous bacteria. Lunch meats and soft cheeses, which can contain listeria. Folic Acid is an important nutrient early in pregnancy. Folic acid has been shown to reduce the risk of neural tube defects, such as spina bifida. Prenatal vitamins contain folic acid and it is present in certain foods. Orange juice, broccoli, spinach, peanuts and asparagus contain folic acid. Some foods, such as breads and cereals are now fortified with folic acid. Neural tube defects occur early in the pregnancy, so if you are trying to conceive, it’s a good idea to increase your intake of this important nutrient. The above is just general guidelines, always check with your healthcare professional before making any changes while pregnant, especially if you have a health condition.